My name is John Simpson. I've been an amateur operator since April 2002, and have held a General class license since 2006-03-07. As of 2014, I still consider myself somewhat of a "newbie" when it comes to amateur radio, which is rather a different experience for me. My normal field of experience is computers and the Internet. I spent almost twenty building and maintaining ISP's in the Orlando area, and I'm used to being one of the people who answers a lot of questions rather than being somebody who asks a lot of questions. At first, my interests in amateur radio were APRS and packet. My first radios were a Kenwood TH-D7A(G) and a Kenwood TM-D700. These are a handheld and a mobile, both with built-in TNC and the logic to do APRS by themselves, either transmitting a fixed location or using an external GPS receiver and transmitting my real position. The TNCs in both radios can also be used for standard AX.25 packet operation. This link should show a map of the last positions transmitted by my radios. The "-1" position is the D700 in the car, and the "-7" position (if any) is the D7 handheld. I am fairly familiar with APRS at this point, although I haven't had a chance to do much packet (no suitable antenna in the air so far.) Also, the TH-D7A(G) is physically a larger radio than I like to carry, so the HT that I carry with me most of the time is a Kenwood TH-F6A tri-bander (2m, 220, 440.) I also own an Alinco DJ-296T 220-band radio- there are a few 220 repeaters in Orlando, and while they aren't very active, I like knowing that I have the ability to use them, and that if I travel to an area which does have repeaters on the 220 band, I will be able to use those repeaters as well. 2004-01-10 I went with Aaron AE4KO to his repeater on top of the Bank of America building in downtown Orlando. The repeater is having problems- the power amplifier on the transmit side isn't working, and anybody within 1/10th of a mile who can actually hear its output is hearing only the exciter. I took some pictures while I was up there. The result of this trip? The radio needs more repairs than Aaron was able to do on top of a building, so it went home with him. Hopefully it will be back soon- I'm using a different IRLP node (node 4248, see www.orlandouhf.com for more info) and when I mention on the air that I'm in Orlando, people are asking why the 4510 node (Aaron's repeater) doesn't seem to be working. 2004-10-01 Because Orlando was hit by four hurricanes in the same year, the company which was providing the wireless internet feed to the top of the building has decided to discontinue their wireless service in Orlando. (The amateur repeater and antennas fared well during the storms, but the wireless ISP's equipment was not so lucky.) Therefore the repeater has no internet feed available, and can no longer function as an IRLP node or an APRS igate. We are looking at a few potential ideas for getting internet access to the top of the building, but so far no solution has presented itself. I've also written a page about the Alinco DJ-296T. This one actually includes working software, if you know how to work with Perl command-line scripts. The computer I use every day is a Macintosh. I have created some Mac icons of the radios I own. Note: credit where credit is due, the original graphics came from Kenwood's web site, Alinco's web site, and Yaesu's web site. And for the sake of completeness, I no longer own the Yaesu VX-7RB. 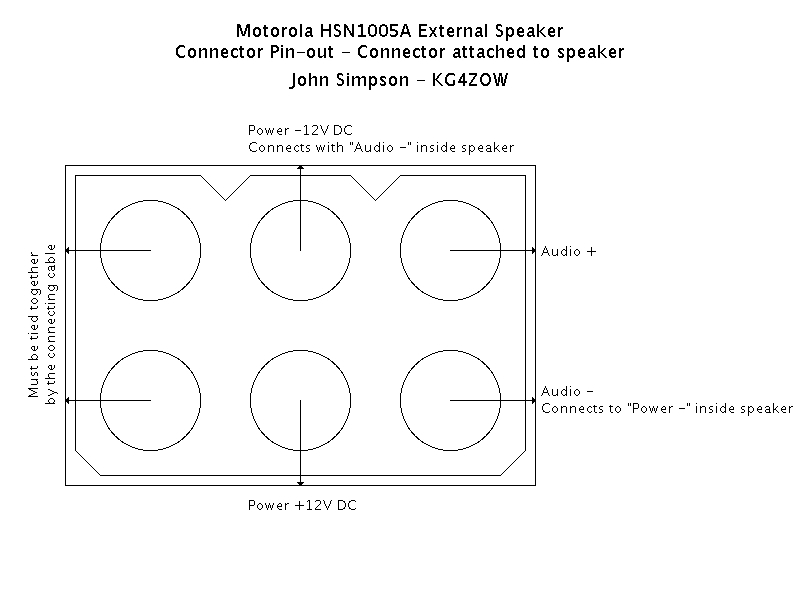 I picked up a Motorola HSN1005A amplified external speaker at the Leesburg tailgate, but was not able to find any reliable information on the net concerning the pin-out of the connector. From three different web pages and my own trial-and-error with a continuity tester I have figured out the pin-out. This image shows the pin-out of the connector which came on the radio, and which works rather well for both of the radios I've tested it with. I have since gotten a DC power distribution box (the RigRunner 4005) for the car, and am using the external speaker with the D700 in the car. The radio has dual VFOs and can listen to two frequencies at once- I have it set up so that the sound from one VFO goes to the external Motorola speaker under the driver's seat, while the sound from the other VFO is played by the radio's internal speaker under the passenger seat. 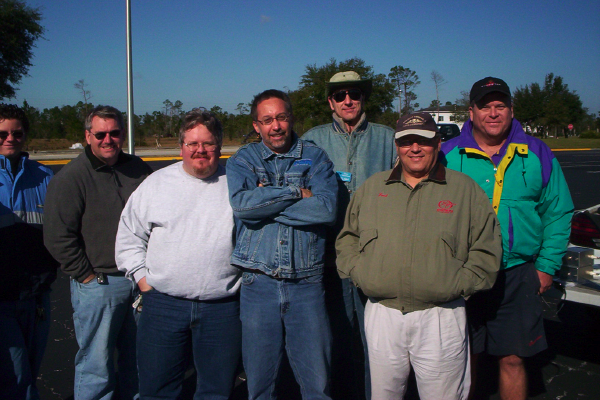 2006-01-14 was a tailgate out at UCF. If you don't know what a tailgate is, the closest thing would be a "flea market" for hams- people who have stuff they want to sell will all bring it to one place and set up tables out of the backs of their cars, and then walk around looking at everybody else's stuff. There are good bargains to be found, but you need to know what you're looking at or you can miss out on some some bargains. You also need to check the items while you're there, and make sure you have a way to reach the seller of anything you buy- one of the local hams purchased what was presented as a working scanner, but most of the internal components had been removed- the only thing that worked was the display backlight. Caveat emptor. 2006-01-21 Google has FINALLY released a "beta" version of their incredible Google Earth program for Mac OS X. I've started playing around with it- again, all I can say is "incredible". One of the things it lets you do is save a position to a file. This file is a saved place marker for my house, if you are interested. The "description" includes links to this site and my non-amateur web site, as well as a link to a smaller version of the picture at the top of this page. Once I got my General ticket and had HF privileges, my next priority was to get an HF rig. Several months ago I started putting money away, planning to buy a radio once I got my General ticket- and when I finally took the test, I just happened to have enough to buy a Yaesu FT-857D. All I can say about this radio so far is "WOW!" 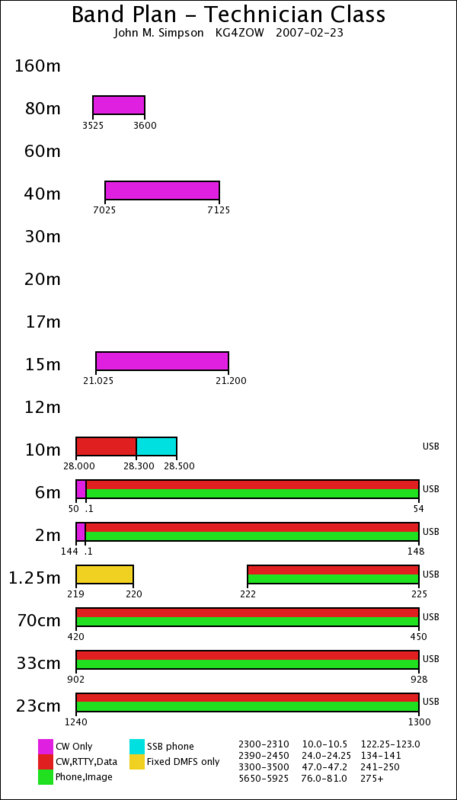 Not only does it do the main HF bands, it also does 160 and 6, plus the 60m channels, plus the 5167.5 emergency channel in Alaska, plus 2m and 440 on a separate antenna. It does interface to the computer- in fact the computer is able to control all functions of the radio (unlike most of my other radios, where the computer interface is limited to maintaining memories.) The FT-857D has too many features to list here- suffice it to say that after several weeks of research, this was by far the best "bang for the buck" I was able to find. I was also introduced to a program called Ham Radio Deluxe, which interfaces with the FT-857D (as well as about 20 other kinds of radios) and includes a mapper, a PSK31 program, an automated log bok, a DX Cluster program, a satellite tracker, a list of shortwave broadcast frequencies... the program is absolutely incredible. I have the CAT cable to use the program with the radio, and I'm waiting on the audio interface so I can do some PSK31- in fact my very first HF QSO was on PSK31 using a friend's FT-857D and Ham Radio Deluxe. 2006-08-08 The G5RV has been installed for a few months, hanging from the trees above my house. I'm using an LDG AT-100Pro tuner with it, have had excellents results on the 20, 40, and 80 meter bands, and good results on 6, 10, 15, and 17 meters. 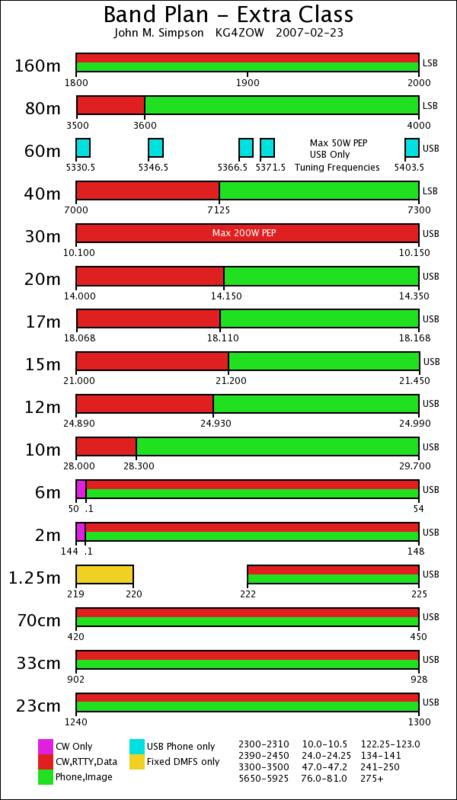 It doesn't seem to be able to tune the 160m band very well- sometimes it will, sometimes it won't. I'm not sure if the problem is the tuner or the antenna itself. I'm toying with the idea of building a Moxon antenna. The Moxon is a highly directional antenna, and is very small for the level of directionality it provides. There has been a lot of interest in building Moxon antennas for the HF bands, but my interest (for now) is in building antennas for the VHF bands- 2m, 1.25m, and 70cm. Part of building a Moxon is getting the dimensions correct. L. B. Cebik, W4RNL, has an excellent web page which explains the formulas for calculating the dimensions of an antenna, based on the desired frequency and the diameter of the emitters. His page includes a simple BASIC program to do the calculations, I have written a web page driven by a CGI script which does the same calculations. You can also download the source code for my program. 2007-02-23 Today was a little piece of history... the morse code requirement was dropped for all Amateur licenses. It kinda makes me proud that I DID pass a morse code test before the requirement went away. As part of this change, existing Technician licensees inherit the HF privileges formerly reserved for the "Tech Plus" licensees (i.e. Technician licensees with a CSCE showing that they passed a morse code test.) 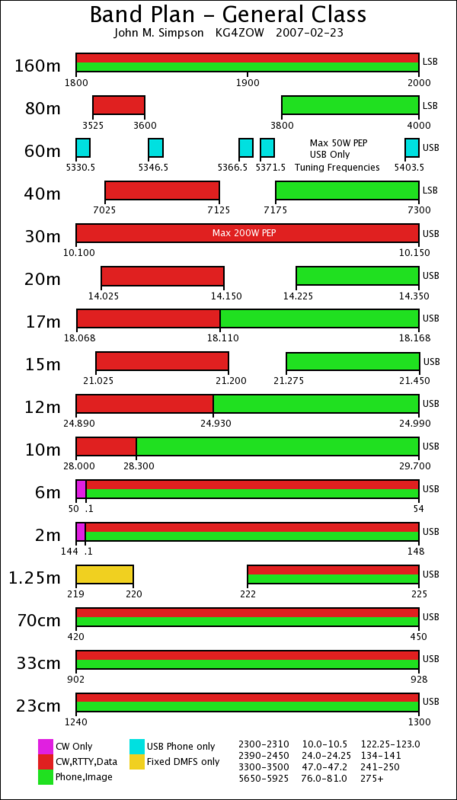 However, during a conversation on a local repeater today, I was reminded that the FCC also changed the actual frequency ranges on which Technicians (and Novices) have privileges, even though the copy of 47CFR97 available through the FCC's web site has not been updated yet. It also turns out that the band plan charts that I had picked up at the Orlando Hamcation a few weeks ago are not correct, and the PDF files on ICOM's web site have not been corrected either. Last year, when I got my General license and started using the HF bands, I found myself constantly having to re-check the band plan chart I was using at the time, because I wasn't sure I was reading the correct lines (and let's face it, how many of us have the exact frequency ranges memorized anyway?) So I made up my own chart showing JUST the privileges attached to the General license. Today's changes made me think of the chart I had done, and how I had wanted to make a smaller version- small enough to carry in my wallet, like a business card. So I fired up GIMP and created an image the size of a business card- but I created it as a 300dpi image rather than the usual 72dpi image, so that I could include enough detail to make the card useful, and so that if I "blow it up" to a full page, it won't be pixelated to the point of not being usable. Then I figured it might be nice to make similar charts for the Technician and Extra class licenses as well... and it might be nice to make PDF files for people who might need them- in both business card size and full-page size. 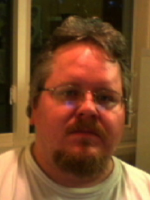 These files are Copyright © 2007 John M. Simpson KG4ZOW, and are distributed here under a Creative Commons Attribution-NonCommercial-ShareAlike 3.0 License. If you find the card or the full-page chart useful and want to repay me, you may do so by doing a good deed related to Amateur Radio- help somebody get their license (or an upgrade), help somebody build or erect an antenna, volunteer to help with emergency communications, help organize a Hamfest or tailgate, or something else which is positive and is related to Amateur Radio. 2007-05-30 Every so often I look up somebody's call sign on QRZ.com. Normally this is a two-step process- first go to QRZ's main page, then type in the call sign I'm interested in. However, Firefox and several other browsers have a box which lets you send queries to search engines (such as Google) without having to visit that site's home page first. This page explains how I wrote a search plug-in which teaches Firefox (and in theory, other browsers) how to treat QRZ like a search engine- when I type in a call sign, instead of "searching for it" on Google, it sends it to QRZ and shows me the information. 2007-07-18 My radio at home is a Yaesu FT-857, and I have an LDG AT-100Pro tuner to match it with my HF antenna, a home-brew G5RV. One of the optional accessories for the tuner is a cable, LDG part number "Y-ACC", which connects the tuner to the radio and allows you to press the "Tune" button on the tuner without having to manually key the radio in order to do a tuning cycle. The local ham radio store, Amateur Electronic Supply, doesn't stock this cable anymore- and even if they did, the list price is US$12.00, which to me seems rather expensive. Looking at the connections on the radio and the tuner, I can see that they both use a standard 1/8" plug, the same size you would find as the headphone jack on a portable radio or CD player. And a picture of the cable on the internet shows me that both ends are the "stereo" versions of the connector, with three conductors. I had a male-to-male stereo headphone cable laying around, and tried connecting it to the radio and tuner. It did not work, which tells me that the pin-out is not the same- the cable I had was "straight through", each conductor connected to the same conductor at the opposite end of the cable. The other night, on the local "traders net", I put out a call to see if anybody had an extra one that they weren't using, or even if they were using it, if I could borrow it long enough to use a continuity tester and figure out the pin-out for it. It turned out somebody out there did have an extra one (thanks, Bruce!) I have it now, and it does making the tuning process easier- now I only need to use the keyer if I'm going to be sending CW, and I don't do that very often. Since the information doesn't appear to already be out there, and since I think it would be helpful for other hams, I figure I'll put it out there. Basically, the plugs have three conductors, which I call "tip", "ring", and "shield". 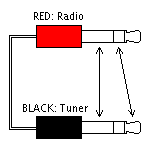 The shields are connected, and the "tip" on the tuner (black) end connects to the "ring" on the radio (red) end. The remaining conductors (the "tip" on the radio end, and the "ring" on the tuner end) are not connected to anything. If you're the kind of person who finds it easier to deal with diagrams, I've also made up a little diagram (which should appear to the right) to make it easier to see how things are connected. My only complaint about the cable itself is that it's only about a foot long- which is fine if you have the tuner and radio next to each other (as I do) but for somebody who may not have the radio and tuner together, I can see this being a problem. This information makes it possible to make your own cable, as long as you need. The other thing on my "wish list" would be a way for the RADIO to tell the tuner to initiate a tuning cycle, other than keying up, talking, and waiting for the tuner to do its thing... but I guess that's not the end of the world. I wonder about this, because I know a lot of people are using 857's in their cars- in fact if I ever decide that I want to do HF mobile, my plan is to buy an 897 for the house and move the 857 to the car. 2007-11-11 I got an email from John Dorson, K2JHU. He has the LDG Z-100 tuner, and tells me that the same cable pin-out works for his tuner as well. I guess it's kind of obvious, but I hadn't thought to put it here- any LDG tuner which uses the "Y-ACC" cable to interface with a Yaesu radio will work with this pin-out. Thanks for letting me know! 2008-02-27 I got an email from Mark Bohrer, KI6KQD. He says that, according to HRO (Ham Radio Outlet, a nationwide chain of Amateur Radio stores, similar to AES) the Y-ACC cable isn't being made anymore. I haven't called or emailed LDG to verify this, but if it is true (and it seems to be, since AES is not carrying it anymore) then it's a good thing I found one when I did, and even better (for the Amateur Radio community) that I put the diagram on the web. 2009-10-04 Over the past year and a half I've become interested in D-Star. I own two D-Star radios- an IC-91AD handheld, and as of a few weeks ago, an IC-880H mobile. I also have a DV Dongle so I can do D-Star from the computer, without using a radio. The DVTools software (for using the dongle) prints a stream of diagnostic messages to its output channel while running. I have written a Perl script which monitors these messages, looking for call signs. When it sees a call sign, it prints the person's name and location, looking them up on QRZ.com if necessary. http://www.kg4zow.us/dstar/ has more information about the script. The page will eventually have more information about my own experiences with D-Star, however for now I just wanted to get the script up on a web site so people could play with it. 2017-10-14 Thanks to LetsEncrypt, I now have an SSL certificate for "kg4zow.us" and "www.kg4zow.us", so this web site is back to its original name, and the kg4zow.jms1.net hostname now redirects to it.